The exhibition, which will be installed simultaneously at three venues in London, Ontario, brings together objects, artifacts, and texts from diverse contexts and cultures—principally medieval, Native, and colonial. It includes literary and historical works, maps, drawings, pottery, and artifacts and sculpture in a variety of materials. It also features universally recognized “icons” of the Canadian wilderness, including a birch-bark canoe and paintings by Tom Thomson and the Group of Seven. The three parts of the exhibition explore a variety of interconnecting themes. This exhibition focuses on “medieval” Canada (Native objects from the pre-1550 era) and on later cultural exchanges between Canada’s First Nations and European colonists, especially in the area of transportation technology. This site also features images of Native and Euro-Canadian leaders as well as historical maps and representations of the southern Ontario landscape that document its transformation from “wilderness” into medieval-inspired town- and cityscapes. The North American and European Middle Ages left many other lasting imprints on life in present-day Ontario, among them the canoe, now a prominent symbol of Canada, and a Gothic-style university established at Ontario’s “western” frontier (the University of Western Ontario). The scope of Mapping Medievalism at the Canadian Frontier at this site will be extended by an exhibition on Mapping Iroquoia by the internationally renowned First Nations artists Jeff Thomas and Shelley Niro. The Weldon Library possesses one of the finest collections of Canadiana in the country. The John A. Schweitzer Gallery in the Archives and Research Collections Centre (ARCC) highlights some of these treasures, among them primary materials pertaining to the history of the Great Lakes region, and historical and literary texts (e.g., early editions of works by Horace Walpole, Ann Radcliffe, and Anna Jameson) that influenced the reception of “medievalism” at the Ontario frontier. Display cases in the Library’s main concourse explore related topics, including the Canadian literary genre of “wilderness Gothic,” and nineteenth- and twentieth-century myths about the Vikings, who voyaged to Canada in the years around 1000 CE. 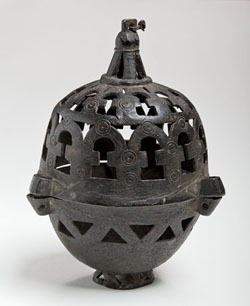 Medieval objects from the Malcove Collection, University of Toronto Art Centre, and Native objects from the Ontario Museum of Archaeology from approximately the same era (800-1500 CE), will be placed together for the first time. This will permit visitors to study and cross-reference the “real” European Middle Ages and the “real” North American Middle Ages, both of which have left distinctive imprints on daily life and culture in Canada today. 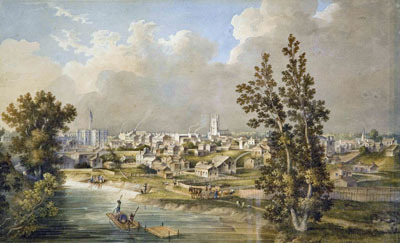 This section of the exhibition also analyzes the invention of the new London on the Thames, where a Gothic-style “castle” was the first building to be constructed (1827-29). This unique castle-courthouse, located next to Museum London, was an early participant in the international Gothic revival. Images of frontier “primitivism” and paintings of Ontario’s northland by Tom Thomson and the Group of Seven are also interpreted through the lens of medievalism. After this multi-venued exhibition is underway a fourth venue will open at the ArtLab and Concourse Gallery in the Department of Visual Arts in November 2010. A series of exhibitions will feature a variety of responses to Mapping Medievalism at the Canadian Frontier by students enrolled in studio art and art history courses in the Department of Visual Arts at the University of Western Ontario (see Events and Programming).